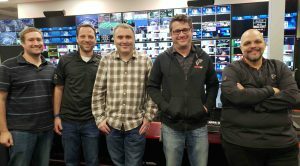 The team at AMB Sports + Entertainment, the subsidiary of AMB Group that oversees scoreboard technical facilities and operations, gave their facilities a technical facelift to ensure it was ready to meet the expectations of Super Bowl fans. “We have a fully IP infrastructure and we expanded it for the Super Bowl as our existing system was repurposed and, now, we have room for 56 additional sources and destinations without adding extra gear,” said Ben Dolinky, AMP Sports + Entertainment, video engineer. system can manage multiple Ross XPression BlueBoxes, the high-end 3D graphics engine found in the Studio version of Xpression but without the user interface. At Mercedes-Benz the Tessera powers a system with seven BlueBoxes, six of which are dedicated to the Halo board, ensuring that broadcast images can be scaled in realtime and in sync across those six BlueBoxes. The halo 360-degree video scoreboard at Mercedes-Benz Stadium requires all of that processing power but even that single Tessera system has its limits. “There is no way to build a show and run a show at the same time in a single Tessera system so with two we can build a show while the other is running a show and then fire a salvo stack to go from one to the other,” said Dolinky. The second Tessera system also gives an additional level of redundancy for the Super Bowl as the two systems run in parallel. “The Ross Dashboard control system allows the operator to control the router so that if one of the six BlueBoxes goes out we can make a route to the other BlueBox in the other stack and no one will know,” says Dolinky.